No matter how much you love your job, Monday blues can hit anyone. Wrecked sleep patterns and sudden change to your daily routine can both affect your feelings towards Monday. However, according to an infographic by Accountemps posted on Lifehack.org, it’s not just on Mondays that you may see your workforce flagging. In fact, it’s only Tuesday that’s looking positive for a fully productive team! This is one of the many reasons why sprucing up your workplace with office wallpaper could create a more motivated workforce. 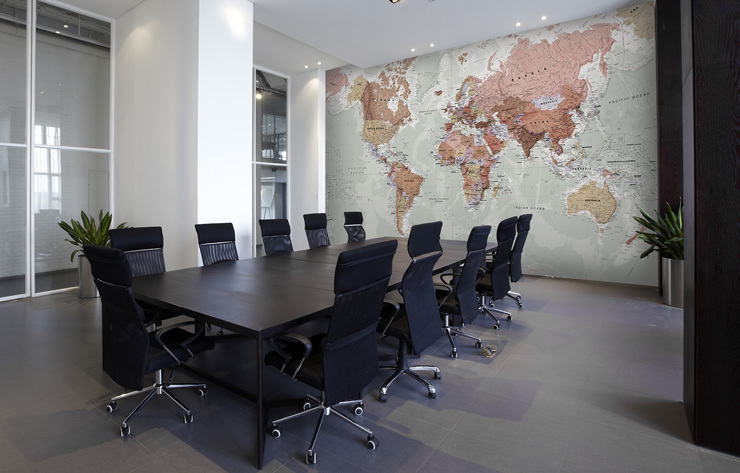 Office wallpaper can bring a dull boardroom into an interactive one, especially with map murals. 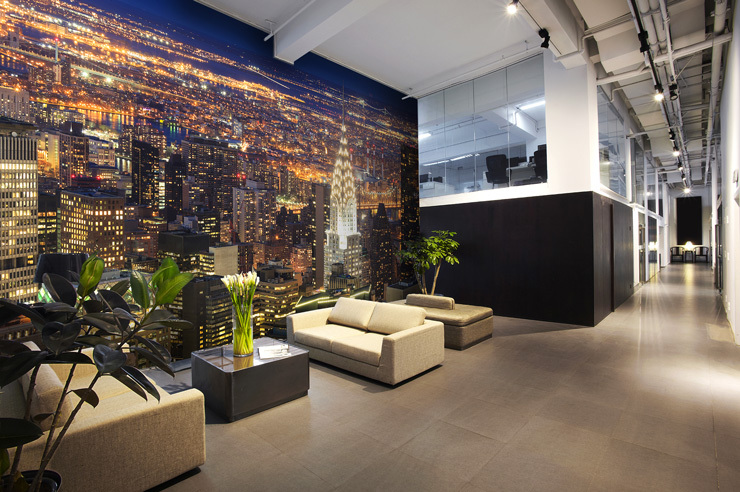 Windowless offices can create its own spectacular views with fresh floral wallpaper murals or breathtaking skylines of its associated cities. The possibilities from our extensive collection of wallpapers mean that there’s something for the office. 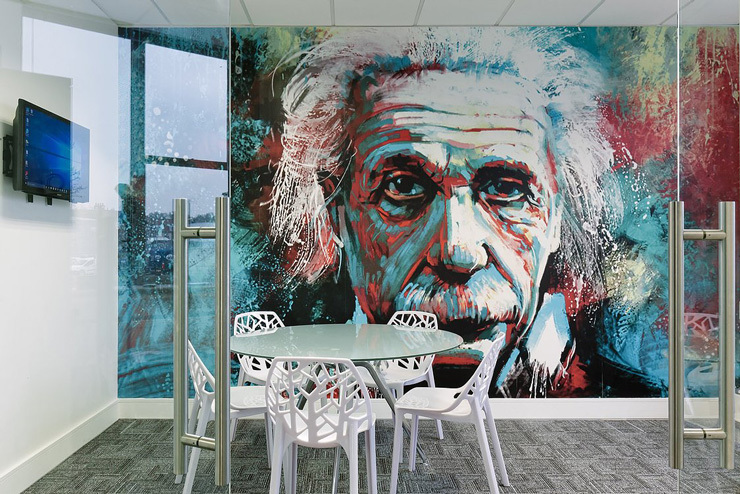 In this post, we’ll introduce you to eight types of office wallpapers that if not motivate your workforce, will create that ‘wow-factor’ to clients and visitors. 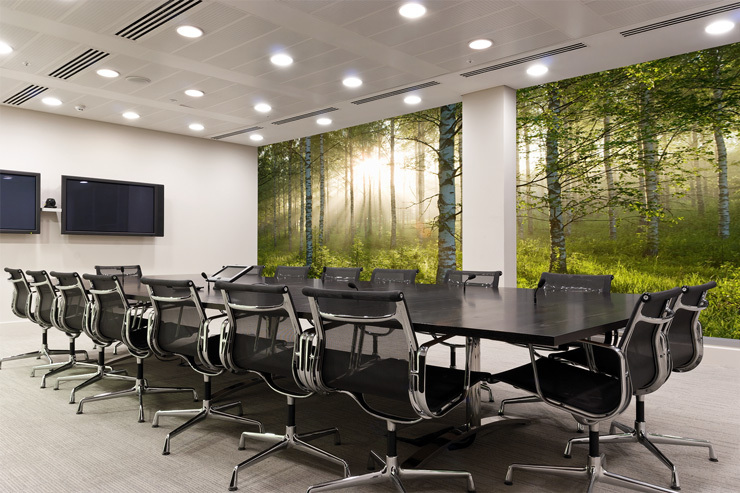 If your establishment is based in a bustling city or lacks natural light, then you might want to consider an office wallpaper that will bring the outdoors in. Wallsauce.com offer many wallpaper murals that reflect tranquillity and present refreshing colours. From stunning lake wallpapers to tropical beach wallpapers, get creative minds flowing in the open wilderness! Investments management company, Ruffer have turned a grey wall into an uplifting scene that will also elongate the workspace. Note the colleague in the background! Boardrooms are essential for meetings, planning and discussions. To regain focus from your team opt for a wallpaper that can encourage interaction. For a boardroom that plans for events around the world, then it may be worth considering a map mural. They come in a variety of colours to suit your existing office décor and are available with and without listed countries. Workspaces without windows are not uncommon. According to The Spruce, bringing in oversized pieces of art into your office can immediately create a feeling of a strong shift in the feng shui feel in your space. A clever way to give an illusion of a window is to cover an entire wall with a skyline wallpaper. The reason we’d encourage you to order your skyline wallpaper to cover the entire wall is that as you can see above, it becomes more impactful. Not only is this type of wallpaper great for windowless offices, it’s also amazing at making a small room feel bigger. 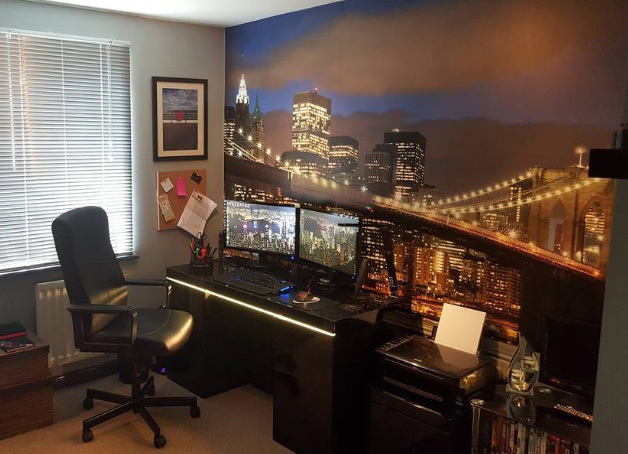 This customer image is a great example of how a cityscape mural can also work in a study or home office. Not only does our library of images include stunning photo wallpaper, it also homes some fantastic artwork! 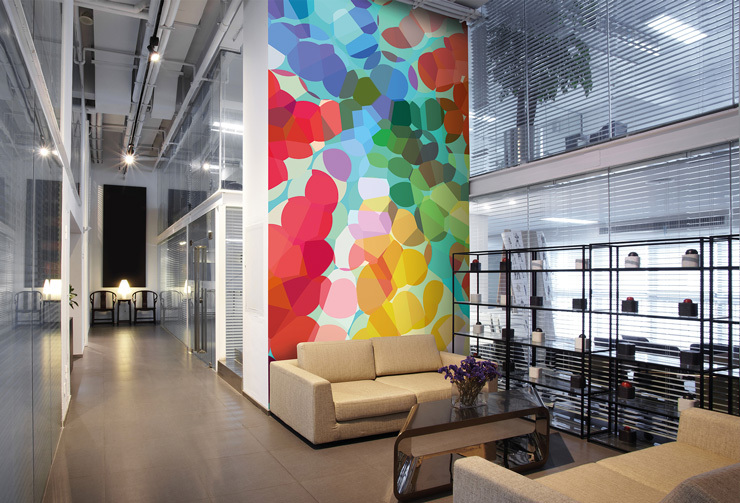 From paintings by fine artists to modern day illustrators, spruce up your office wallpaper with stylish art wallpaper. What else could communicate power and loyalty than a majestic animal wall mural? 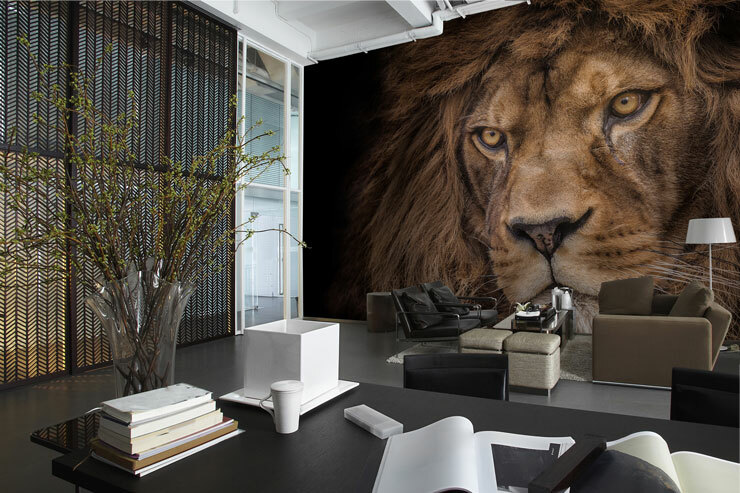 From striking lion wallpapers to stampeding elephant wallpapers, bring the authority of one of the world most powerful animals to your wall and create one heck of an impression at your business. If we haven’t celebrated our vast collection of office wallpapers enough, then you need to hear about our designer collection. The ever-growing list of designers consists of illustrators, photographers and artists sourced from around the world, who deliver spectacular designs, perfect for murals. One of the most favoured artists that commercial spaces love, is Shandra Smith. Shandra’s designs are colourful and contemporary and look great in any space. This office in San Diego chose one of Shandra’s designs to fill space in one of its social areas. As you can see, it works really well with other colourful elements such as the orange door. 7. Tree wallpaper is always a great option! Tree wallpapers are amongst our most popular designs. 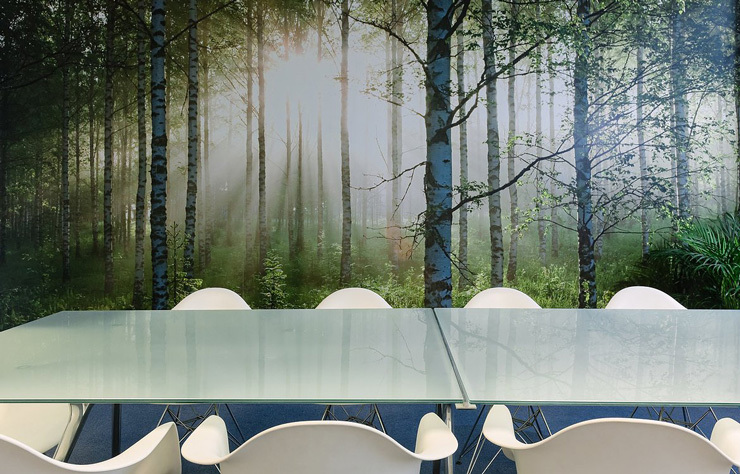 Both homes and commercial spaces can benefit from the crisp greenery and mesmerising sunlight of a forest mural. They are a win for everybody and look great in any style of room. Check out our birch tree wallpapers for a stylish look. If you’re looking for something that is completely bespoke, that’s unique to your company, then you have a couple of options. Wallsauce.com offer in-house designers that are able to manipulate and create custom office wallpapers. For businesses who would like to create its own artwork with perhaps branding, then they can upload it on our website and we’ll simply create your own wallpaper. Here’s what C7 Architects uploaded and we turned into wallpaper. 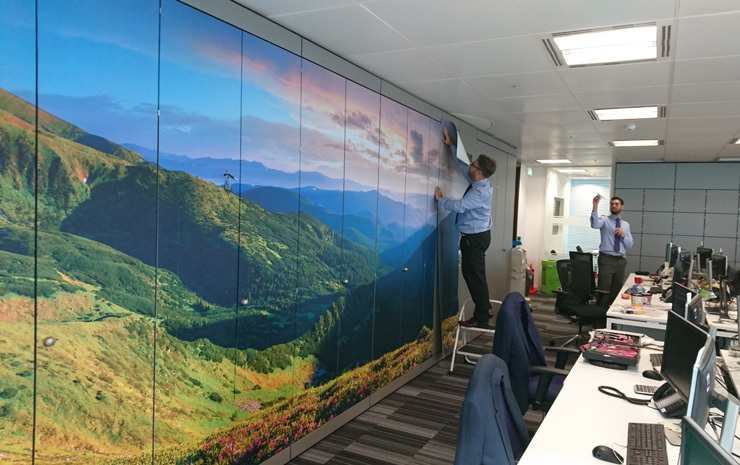 Whether you’re looking motivate staff in the office or engage them in the boardroom, there’s an office wallpaper that can transform your space. For more inspiration and ideas for office wallpaper, head to our commercial page on office wallpaper.